I am Silver, and there is no other pirate like me on these waters . . . This being the last testament of the infamous pirate Long John Silver, you would do well not to trust a word in its pages. Held captive aboard his own ship, the Linda Maria, he is to be taken to England, where he will hang at the king's pleasure. But he has another plan: to tell a tale of treason, murder, lost treasure that would rival King George's own riches, and what really happened on Treasure Island . 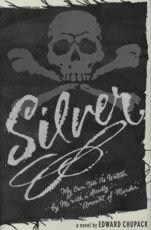 . . if Silver is to be believed. His beginnings as a pickpocket on the streets of Bristol are as dark as the rest of his deliciously devious life. Taken to sea by the pirate captain Black John, Silver soon learns the arts of the sword, saber, and pistol. He makes his trade in plundering, cheating, ransacking, and murder -- more murders than he can bother to count. British, Frenchmen, Spaniards, and Portuguese all fall before him. He takes exceptional pleasure in murder, but never such pleasure as he finds in his search for a most uncommon treasure. To find that treasure he must heed the words of a dead man, solve the ciphers in a well-worn Bible, forgo the love of an extraordinary woman, and climb over the corpses of friend and foe alike to arrive at Treasure Island and find his fortune. Silver's tricks are never done. Before he greets the hangman at Newgate Square, he will have one last secret to reveal. Hidden in these pages are clues that lead to his remarkable treasure. And although King George's bounty for this notorious scourge may be handsome indeed, the captain who has captured Silver would not mind adding the pirate's riches to his own purse. He will let Silver tell his tale in the hope of learning clues to the treasure's location. And if you were to mark his words as well, you might discover the whereabouts of that fortune yourself. So we shall, for now, allow Long John Silver to spin his stories, tales of adventure and betrayal, gold and jewels, love and murder. And he will never leave out the murder. Not Long John Silver.